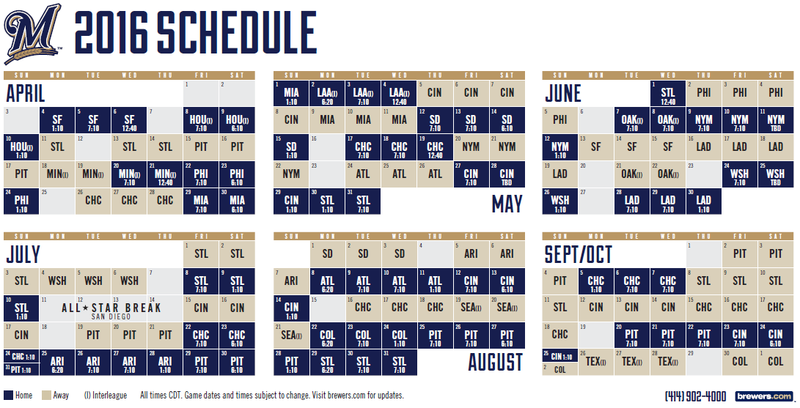 The Milwaukee Brewers today announced the Club’s 2016 Spring Training broadcast schedule that will once again include 16 radio broadcasts on 620 WTMJ and the Brewers Radio Network, 10 additional audio webcasts, and 14 games televised by FOX Sports Wisconsin. The only games that will not be broadcast on either radio, TV or webcast are the Wednesday, March 2 exhibition against the University of Wisconsin-Milwaukee and, for some reason, the home game of the split-squad Cactus League openers date on Thursday, March 3 against the Cubs. 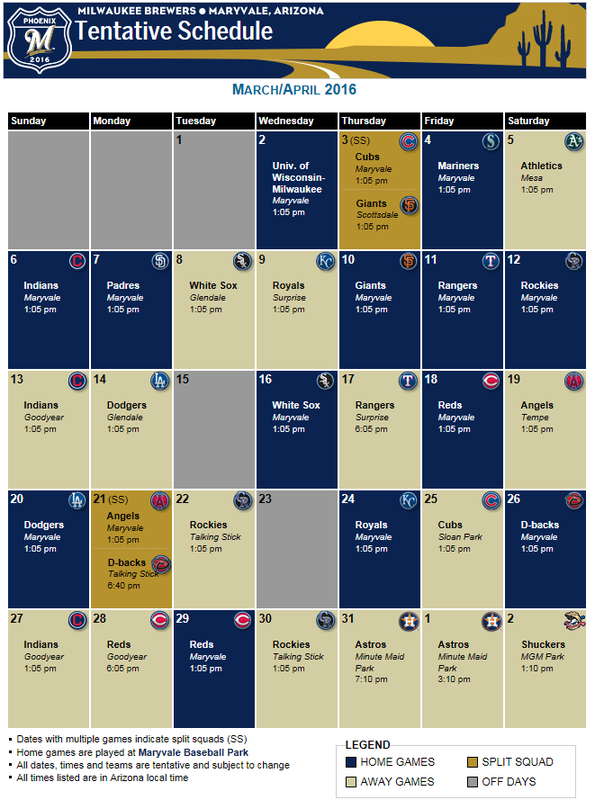 What follows is the official information regarding the schedule of events for the upcoming “Brewers On Deck” fan fest scheduled for Sunday, January 31, 2016, running from 10a – 5p that day. If you missed the list of announced attendees (which I will continually update as names are added/removed), click here. The Klement’s Main Stage will include various Q&A sessions with top Brewers baseball executives, the coaching staff and game shows. The Brewers Interactive Stage will feature Kids Only Question and Answer sessions, where youngsters interview players, and a roundtable discussion with members of the Milwaukee media who cover the team on a regular basis. Brewers Community Foundation will host a Treasure Hunt, featuring some hard-to-find Brewers items on sale as well as a live auction at 12:00 p.m. on the Interactive Stage. Additionally, BCF will hold a 50/50 Raffle. The winner will be announced at the Interactive Stage following the coaching staff autograph session. Photo sessions with players are also scheduled throughout the day in designated photo areas. The Brewers Team Store by Majestic will have a full set up with the latest Brewers merchandise for sale and a Brewers Museum will feature memorable artifacts from throughout the history of the team. Details on the autograph and programming schedules are listed below. 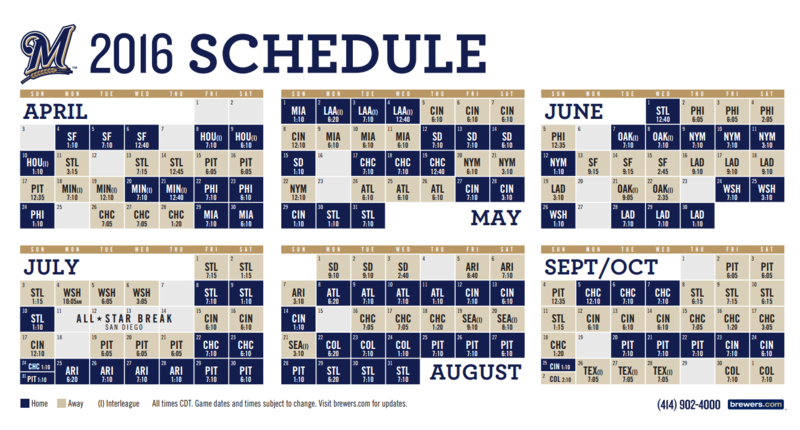 The schedules are subject to change, with the latest version and more information available at Brewers.com/ondeck. Autographs this year will be either free, $10, or $25 with proceeds benefitting Brewers Community Foundation. Recipients of “PREMIER” autographs Ryan Braun, Rollie Fingers, and Bob Uecker will be chosen through a random selection process. Each fan in attendance will receive one Premier Entry card which may be redeemed at the Random Selection area outside the Main Exhibit Hall of the Wisconsin Center. The Premier Entry card will be exchanged for a numbered coupon and entered into the random selection process for any one of the select Brewers players. Coupon distribution will be available at 8 a.m. the day of the event and will continue up to an hour before each designated autograph session. Fans are also invited to stop by the Social Media Stage for fun and games. Fans can post their photos from the event to Twitter and/or Instagram using the hashtag #BrewersOnDeck for a chance to win prizes such as a trip down Bernie Brewer’s slide, game tickets and more. For contest rules, visit brewers.com/ondeck. Children are invited to visit the Farm Teams Infield for free batting and hitting clinics scheduled throughout the day. Brewers alumni and players will be on hand for the instructional sessions. In addition, kids can run around the field or play games with Brewers players in the Fan Cave. 10:15 a.m. – Welcome and Meet the Coaches – Brewers Chief Operating Officer Rick Schlesinger will welcome fans to Brewers On Deck. The winners of the seven T-Shirt Friday designs will be introduced. Fans will also enjoy a question and answer session with Brewers Manager Craig Counsell and his coaching staff. 11:30 a.m. – The Brewlywed Game – Brewers players, coaches, prospects and alumni will participate in a game show to see which pair really knows each other the best. It’s the Brewers version of The Newlywed Game. 1:00 p.m. – Meet the Management – Brewers Chairman and Principal Owner Mark Attanasio, General Manager David Stearns, and Vice President – Assistant General Manager Matt Arnold will participate in a question and answer session with Brewers fans. 2:00 p.m. – Brewers Jeopardy – A Brewers player, prospect and alumnus will participate in a game show, similar to the popular Jeopardy television show. 3:30 p.m. – Brewers Face Off – Brewers players and alumni will participate in a game show, similar to Family Feud.